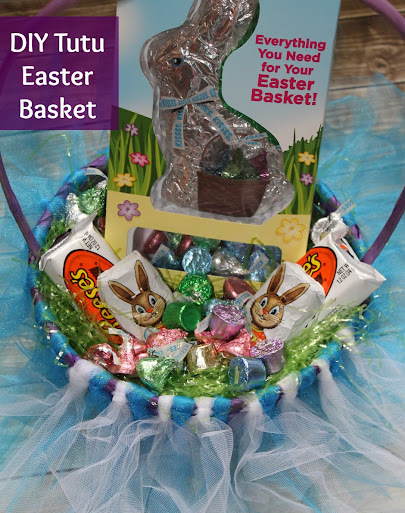 DIY Tutu Easter Basket – Prepping for the Easter #BunnyTrail! I received Hershey’s products to fill my DIY Tutu Easter Basket as well as a stipend from Global Influence. All thoughts and words are my own. Awhile back my Aunt made Bubbles one of those cute tutu skirts. They’re quite adorable, and Bubbles loved it. She liked to put it on and dance and pretend to be things like fairies and butterflies. She’s grown out of it now, so I need to make her one. In the process of gathering the materials to do so, I thought – hey, it’s almost Easter. Wouldn’t a tutu Easter basket be really cute? So I decided to pick up a basket along with a few lengths of tulle and make one along with the skirt. 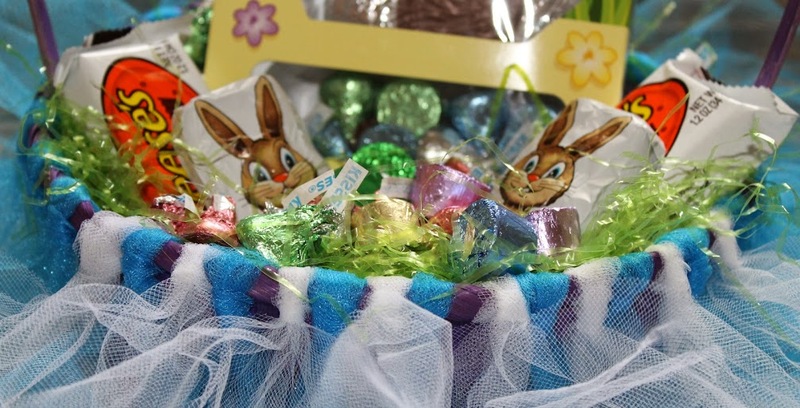 A cute Easter basket has always been a special treat to celebrate the holiday. My Mom started the tradition with her creations and it’s something I’m excited to have been able to continue with my own family. I’m hoping that Bubbles loves her “fairy basket” as much as she enjoyed her skirt. The basket is simple to make: you just need a basket with space along the top to tie the strips, and tulle in the colors of your choosing. Just cut a strips of the tulle (the long side of a yard), and fold them in half. How many you’ll need will depend on the size of your basket, but I used about three dozen. Make a loop at the top of your folded strip, then slide the free ends under the rim of your basket. Bring them up around and tuck them down through the loop, tightening until they are secured to the basket. That’s it! Continue to do so all around the rim of the basket and you’ll be done. I filled the basket with an assortment of yummy HERSHEY treats. Of course it had lots of REESE’S Peanut Butter eggs, Reaster Bunnies (so cute! ), the fun HERSHEY Chocolate Bunny & Kisses combo pack, and some extra KISSES and ROLOS to round it out. 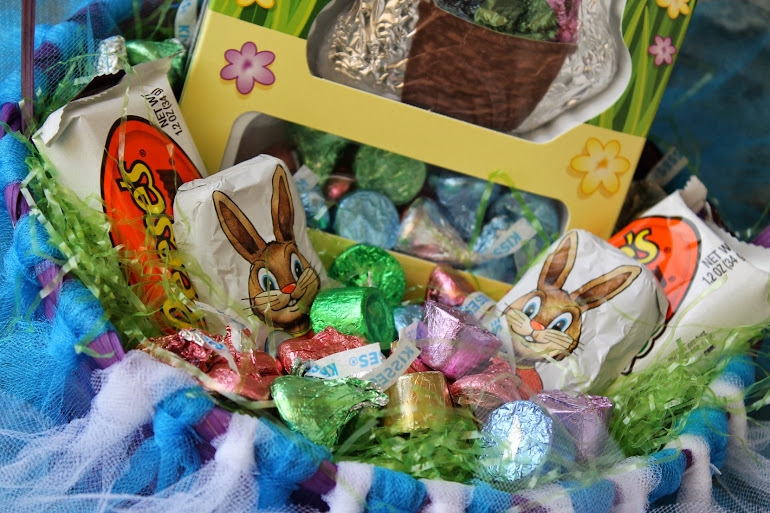 Because everyone likes treats for Easter, I have a fun HERSHEY’S prize pack for one of you! To enter, tell me your favorite Easter tradition AND tell me your favorite Easter craft or recipe found on the CelebrateWithHershey.com website. Giveaway closed. What is your favorite Easter tradition? I like the HERSHEY’S Miniature Easter Egg Tree. We used to dye eggs and then hide eggs. I LoveLoveLove the Honey Baked Ham we also serve for Easter, and I think the templates for coloring eggs are a very cute and easy craft. My favorite tradition is hunting for Easter eggs with my kids. I like the Easter basket cupcakes on the Hershey’s site. We have a Easter egg scavenger hunt every year. Would like to make the Chocolate NUGGETS Flower Basket Cake. My favorite Easter tradition is doing an Easter egg hunt for my grandsons. They love it! My favorite craft is the WHOPPERS ROBIN EGGS Wreath! My favorite tradition is coloring easter eggs with my kids! I’d love to make the coconut marshmallow nest recipe! I like the Spring Surprise Chocolate Cupcakes. I like having dinner at my sister’s house and we have a big Easter egg hunt, and give Easter Baskets. We also all bring a dish and dessert and have a great time with the whole family! We love doing the Easter egg hunting and I like the coconut cake nest recipe. I like Easter Dinner with Ham. I like the baskets on the homepage. I think it’s a cute craft. My favorite Easter tradition is the Easter egg hunt. I can remember how much fun we had.My favorite recipe is the peanut butter bunnycakes. Not only are they cute, but the kids would have fun making them. My favorite Easter tradition is spending the day with my family at my parents’ house. I love the Easter basket cupcakes. I really like coloring the eggs with my girls. My personal tradition is gorging on coconut cream eggs and my favorite recipe is the raspberry chocolate cheesecake. We have a HUGE easter egg hunt at my parents house every year! It is so much fun because even the adults join in! I like the easter basket cupcakes! So cute! I would love to try the Easyer Bunny Basket cupcake and our tradition is finding Easter Eggs. We dye Easter eggs and always go to an Easter egg hunt. Oh and eat ham! The Rich n Good Chocolate Truffles look really good! We love our egg hunt – the recipe that looks yummy is the Chocolate peanut butter rolo cookies. Ham is always on Easter.Making our own baskets out of butter tub bowls,they always turn out so cute! I like hosting an Easter egg hunt for my kids and their cousins and I like the MOUNDS Coconut Easter Basket Cake recipe. my favorite tradition is dyeing easter eggs then having a big family egg hunt after a family dinner. i like the Easter Bunny Egg Racers craft. On Saturday we have an egg hunt at our church for the community and on Easter we at church to worship. I think the Mocha Truffles look good. My favorite would be the Easter Egg Hunt. I’d like t try the Peanut butter Bunnycakes. The Festive Peanut butter Chocolate Fudge looks so delicious. We do an egg hunt with our neighbors and kids and on Easter, my kids always have an egg hunt inside. We love having a cookout while the kids have an egg hunt. I really love the Spring Hop Scotch Craft, it can be played inside or out. The peanut butter bunnycakes look great! My favorite tradition is easter baskets! I like the HERSHEY’S Foil Egg Wreath. We hide plastic eggs outside with slips of paper inside with small gifts written on them. I would like to make the Easter Bunny Egg Racers. I have lots of favorite Easter tradition – My large family getting together at my grandparent’s house every year probably tops the list. Been doing it as long as I can remember. I love the Easter Basket cupcakes, they just might be the most adorable cupcakes I’ve ever seen!! My favorite easter tradition is reading the bible with my husband and my favorite craft is the HERSHEY’S KISSES Caramel Flowers. Id like to try the coconut cake nests and the mini Easter egg tree craft for a centerpiece. the Hershey’s site is the Velvety Chocolate Cream Pie. We have a giant outdoor easter egg hunt. I really like the coconut marshmallow nests that are on the Hershey’s site. Our favorite tradition is decorating the eggs and hiding them. From Hershey’s, I like the craft idea for the spring birdhouse centerpiece. We participate in a town Easter Egg Hunt that the kids love doing with their friends. I also would love to use the beginner Easter Egg Stencils to decorate our dyed eggs with my kids. My favorite Easter tradition is dying eggs with my girls. My favorite recipe is the velvety chocolate cream pie. My tradition is vigil Easter Mass and I like the Reese’s Racers. we do an easter egg hunt each year. I really love the Bird Nest Cup Cakes! I like the Reeses Racers, and my favorite tradition was having a jelly bean trail lead me to my basket! Our family dinner and egg hunt. I would like to try the Easter Basket Cupcakes recipe with my granddaughters. I love their Backpack Basket. I know my grandkids would really love them.